I chose to share this image because of how powerful it is. 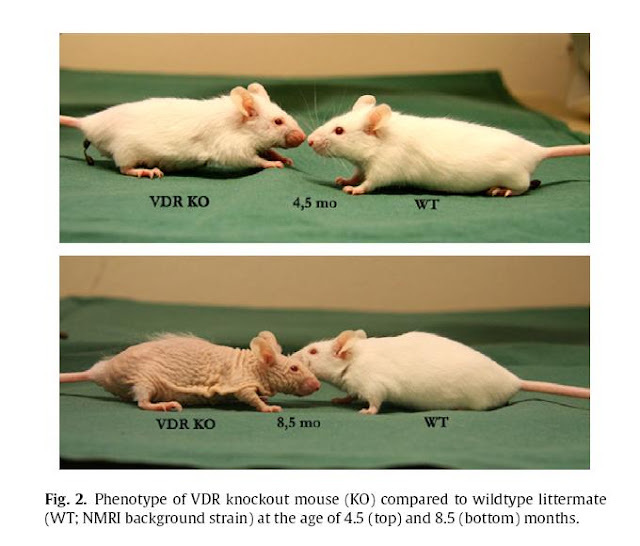 The two mice in the first image are the exact same age. Months later, the same two mice were photographed again. But this time, there is a stark difference in the appearance of one of the mice. The poor thing seems to have aged at a highly drastic rate in a short period of time. What's the difference? In image 2, the mouse is highly deficient in vitamin D. One of the most obvious differences between the two is drastic loss of hair. Next we see excessive wrinkling of the skin and loss of volume. Basically, the VDR KO mouse has aged rapidly. If this doesn't open your eyes to the possible consequences of vitamin D deficiency, I don't know what is. Luckily most of us don't have a gene that stops the body from absorbing vitamin D but, many of us are vitamin D deficient. If you live in cooler climates, you're not absorbing enough D through your skin. And if you are African American, you could also be at risk of being vitamin D deficient. Allow me to explain how vitamin D could be related to aging. At the end of our DNA strands are caps which are called telomeres. Think of them like the plastic caps at the end of a shoe lace that protect them from fraying. They basically help protect the cells from degrading. Here's the thing, telomeres can range in length. The longer they are, the better. But, with natural aging our telomeres shorten. Meaning, if you look at the telomere length of an older person, it'll be shorter than if you were viewing that of a younger individual. Telomere length is a biological marker of age, kinda like looking at someone's dental records and identifying how old they are. Living an unhealthy lifestyle can actually speed up the rate of the shortening of the telomeres. If you smoke, don't exercise, eat horribly, or have a stressful lifestyle, you are directly making an impact on your telomere length and, essentially shortening your life. A study was done were the telomere length of twins were measured. If one twin had a higher vitamin D level in the blood than her expected lifespan was expected to be higher by around 5 years. Why? Because her telomere length correlated with someone who was 5 years younger despite starting with the same telomere length as her sister at birth. I want you to associate the example of the twins with the image of the mice above. Even though they're the same age, the mouse on the left is is aging much more rapidly than it's buddy who is the same age. But why such a drastic change in appearance when only one factor was impacted (vitamin D absorption)? Because vitamin D is responsible for over 1000 physiological processes in the body. Which means if we're deficient, a huge percentage of our body's functions are impacted in some way. When over 1000 processes are involved, a lot can go wrong if you don't have the proper nutrition. This goes way beyond healthy hair and skin. This time of year, I seem to crave the addition of fish oils into my regimen. I think it's a biological response to the reduction in sunlight. Since most of us are not getting enough vitamin D through sun exposure, and our melanin/sunscreen usage further blocks absorption of this much needed nutrient, we have to supplement. I'm going hard on the fermented cod liver oil this fall and winter. But along with that, I'll make it a point to be outside for at least 15-20 minutes during the day whenever possible. And, for the first time ever, I plan on getting my vitamin levels tested just to see if there are areas where I need to supplement. Knowing what we know now, I think we need to take this vitamin D deficiency thing a bit more seriously. It's time to supplement our diets with vitamin D3 if we aren't already doing so. Adding fermented cod liver oil not only gives you natural vitamin D, but combines with with vitamin A and omega 3s to make it a complete superfood. If anything interesting comes out of my vitamin testing, I'll let you know. Hi Nadège, thanks for this great article. I would advise you not to take simultaneously vitamin A and vitamin D because vitamin A is an antagonist of vitamin D. This means that when you take both at the same time, vitamin A partially inhibits the effects of vitamin D. If you choose to take both at the same time then, you have to increase your vitamin D intake. (Sorry for my English, I'm French). Definitely agree, when I first started taking my prescribed dose, I had a small growth spurt in my hair.